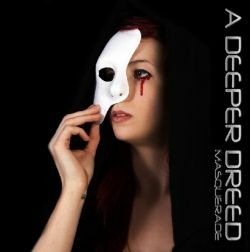 A Deeper Dreed is a very new band from Suffolk, in the southeast of England, who recently released their debut EP Masquerade. Having originated as a cover band playing tunes from outfits such as Iron Maiden, Korn, Disturbed and Metallica, A Deeper Dreed strives to blend the contrasting sounds of their influences into a unique style wholly their own. Such a witches brew is sure to either charm or poison, so hats off to the lads for giving it a try. For the most part, Masquerade gets the band's idea across through prominent twin-guitar leads and interesting songwriting. There are, however, a number of challenges facing the band that, until overcome, will impede their forward progress. The axe-attack of Joe Bassett and Luke Browning is the most significant feature of Masquerade. Every track contains a decent amount of soloing and showmanship, though it's all done tastefully and with a complete lack of wankery. Both Bassett and Browning are skilled musicians, but one of the pitfalls Masquerade suffers from is the sometimes awkward way the two interact. Small but noticeable issues with timing crop up now and then, though such matters are often exterminated over time as a band hones their style. That being said, the EP contains a number of six-string highlights such as the Zakk Wylde influenced licks on "The Cell" and the overall nice lead work on "A Deeper Red". Bassett and Browning support all of their razor-sharp leads with some pretty fine riffing of both the old-school and modern varieties. "The Cell" and "Glass To Sand" navigate more contemporary waters, with the former track having a distinct metalcore feel to it thanks to the frequent chugga-chugga riffing. "A Deeper Red", on the other hand, is the most traditional track on Masquerade with some nice galloping bass from Simon Spence and what I think is the best performance from the two guitarists. Spence, together with his son Cameron on drums, does a very admirable job driving the pace of Masquerade. Besides "A Deeper Red", the bass guitar emerges from the mix fairly regularly and provides added depth to some of the more down-tuned riffs put together by Bassett and Browning. The younger Spence is actually quite impressive behind the kit, throwing in some furious double-kick now and then while always keeping things interesting with fairly complex beats. The vocal performance on Masquerade, delivered by Shaun Lotay, is defined by a number of peaks and valleys. Lotay's crooning style on the title track is a tad rough, particularly when attempting to extend some of the notes at the upper reaches of his range. The same holds true on "Of Me", which points to a possible Achilles' heel for Lotay. When he works in a lower, grittier style on tracks such as "The Cell", the result is a more cohesive, convincing experience. Just like the timing issues I mentioned above, experience will ultimately erase these minor transgressions. A Deeper Dreed is, after all, only at the dawn of their existence. Masquerade shows a band in the midst of defining itself, with a number of influences thrusting about in a struggle for dominance, but the direction A Deeper Dreed wants to take is quite evident. This is definitely an outfit to keep an eye on.